The release of Risen 2 Dark Waters is not too far away so here we have two new gameplay videos the upcoming RPG from Piranha Bytes. EA released the top goals video for this week. As we are used nice goals only from the FIFA 12 players. As many of you expected this game and after the huge success the first BlackOps had, Activision decided to make the second game for BlackOps. The first one has an impressing story and that's the reason why many of you have been waiting for a second BlackOps, i'm sure! The first romours started to appear after the success of Black Ops. It was since then almost clear that Activision won't refuse another game after they can get some pretty nice profit. Then the blackops2.com domain has been purchased by Activision. That's when the things started to become pretty clear. And now this. 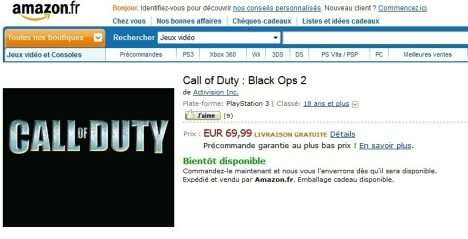 As it ussualy happens, somehow Activision leaked the details of the next game on the french version of Amazon as you can see in the picture! Their official account listed Call of Duty: Black Ops 2 as 'available soon' and the game price will be 69,99E. The game has been removed from amazon but we can now expect a few months before it's release in november to see it again with the same message 'available soon'. Now how many times you wanted to play a fighting game with girls? Kung Fu Factory are releasing a game like that. They officialy announced that they are releasing 'Girl Fight'. The game will be released later this spring. Brutal. Deadly. Gorgeous. Veteran executive producer Microprose and developer Kung Fu Factory announced today that Girl Fight is coming to Xbox LIVE Arcade for the Xbox 360 video game and entertainment system from Microsoft and PlayStation Network in spring later this year. With hair flying, long legs kicking and the ear-piercing shrill of deadly vixens, Girl Fight is a unique all-female, fast-paced spin on arcade-style fighting games. • Fighting Styles and Character Options: Players can select from a wide range of distinct fighters, each with their own fighting style. Players can even create their own experience by customizing their fighter’s appearance and abilities. • Unlockables and Customization: Players will find a robust set of unlockables to further customize their characters by proving themselves as the ultimate femme fatale in the ring. Points can unlock new character skins, more varied abilities and codex entries. • Arenas: Girl Fight takes the players all across a virtual globe in many different arenas, filled in by augmented reality constructs. From war-ravaged San Francisco to the rubble of demolished Foundry buildings, reality and fiction blur in the virtual arenas. Gotham City Impostors Out Now!